The highly versatile FPM-600 Power Meter is the ideal tool for link and system qualification. Thanks to its memory capacity of 1000 data items and converter software, it facilitates data management and enables data transfer to a PC via USB connection. The FPM-600 features a green/red LED indicator that gives you a pass or fail test verdict according to the thresholds you have defined. With more than 40 calibrated wavelengths, the FPM-600 adapts to all network types (LAN, CWDM, high-speed DWDM, etc.). It allows for user-defined measurement wavelengths, using the interpolation method between calibrated points. 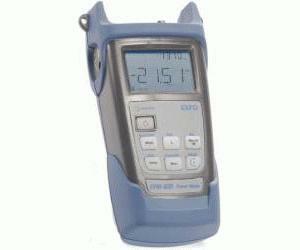 Use its Hold Min/Max Power function to measure system power burst or fluctuations. Like all EXFO portable instruments, the FPM-600 is built for top ruggedness and versatility, perfect for the harshest test conditions. It features a keypad/LCD backlight, for easy operation in darker environments. What’s more, it is powered by a rechargeable battery.